Hey Lucy! Get the Phone! This is an edited version of a post that originally appeared on a blog called The Michigan Telephone Blog, which was written by a friend before he decided to stop blogging. It is reposted with his permission. Comments dated before the year 2013 were originally posted to his blog. Please note that any links to Amazon.com in this article are affiliate links, and if you make a purchase through one of those links I will receive a small commission on the sale. Anyone under the age of 40 may not remember the name, but at one time Crosley was one of the big names in radio receivers and early black-and-white televisions. Even though the original Crosley Corporation no longer exists, the brand name was purchased and is now used by Crosley Radio, a company that makes reproductions of products that are stuck in our collective memories – perhaps from finding them in our grandparents’ attics, or seeing them in old movies and TV shows. Of course, these are only reproductions, and often not exact reproductions due to advances in technology. Such is the case with their line of telephone reproductions. 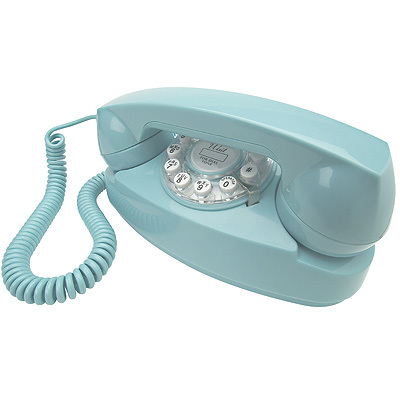 No matter how much you might desire a perfect reproduction of an older model, the fact is that nowadays it’s not really practical to have a phone without touch tone dialing. But that doesn’t mean you can’t come awfully close. … but, it would hardly make sense to offer a black Princess phone. I’m sure these reproductions aren’t perfect. 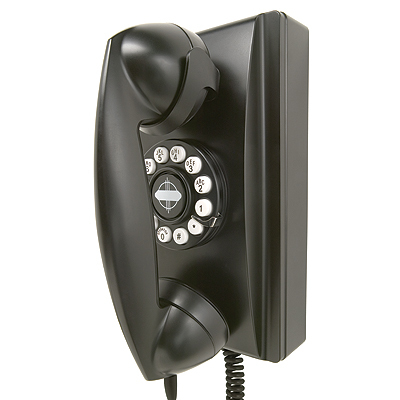 For example, a real model 354 wall phone as made by Western Electric (in the USA) or Northern Electric (in Canada) has slots on the sides so that the ringer could be heard a bit more clearly. No slots on the phone in the above photo, but since it probably doesn’t contain a real mechanical ringer anyway, those slots would not serve any purpose and would just catch dust. Also, the phones come with an earpiece volume control, something the originals usually did not have. Want to buy one? Check out Amazon’s selection of Crosley phones (Amazon affiliate link). 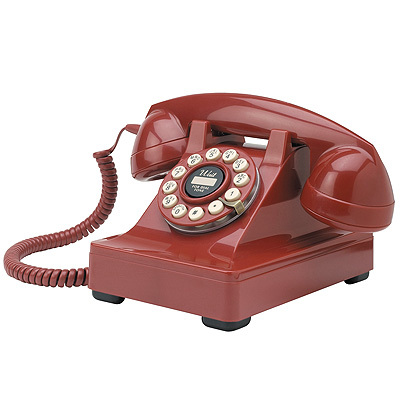 I don’t know how well these actually work as phones (I’ve never actually used one, just happened across their web site), but I’d assume they work as well as other modern phones, and they sure look nice, especially that red 302 desk set reproduction. Crosley Radio (the new company) also makes reproductions of other nostalgic items, such as cathedral style radios and jukeboxes (which play CD’s, not “stacks of wax”), so you may want to download a catalog. So if you are stuck for a Father’s Day gift, and if Dad is into old stuff, set him up with a VoIP service and then plug one of these beauties into it. Of course, you can still find the real thing on fleabay, but unfortunately those old mechanical dials (besides having a tendency to lock up after all these years) won’t work with modern VoIP service. 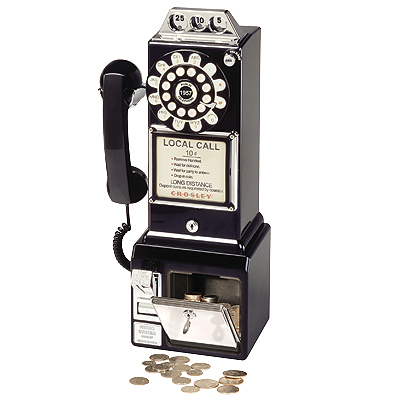 Speaking of which, I wonder why no one sells a dial conversion separately – something that would replace the mechanical dials in those old Western/Northern Electric 300 series phones, and similar phones that used the same size dial (and there were many such back in the day). If they can do it in these reproduction phones, why can’t you purchase the dials separately and put them in the genuine item? Or would that be something no one (except me) would consider doing to one of those old phones? I somehow doubt that – for a while, people were making table lamps out of old candlestick phones, so I don’t think that replacing the old rotary dial with a touch tone unit would be that big a deal, unless you were looking for a museum piece. But, that’s just me. Posted in consumer, hardware, nostalgia, TelephoneTagged nostalgia, telephone reproductionsLeave a Comment on Hey Lucy! Get the Phone!